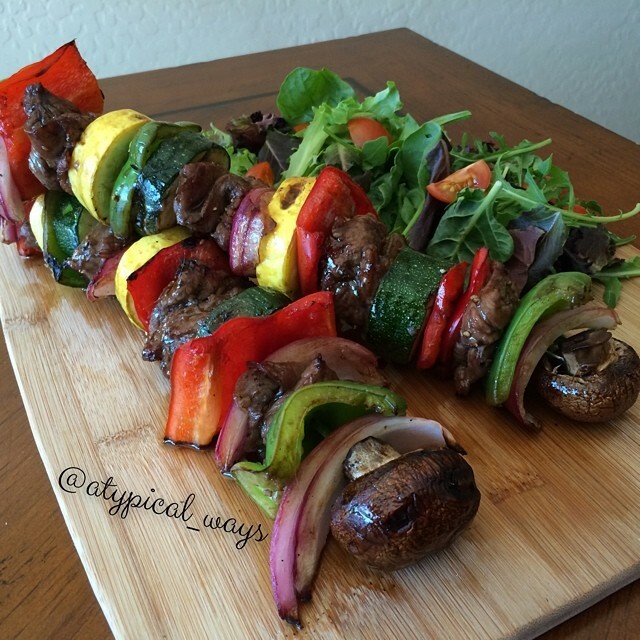 Quick & Simple Grilled Steak Kabobs! In a small bowl mix together the vinegar, agave nectar, olive oil & garlic. Season the steak with a little salt & pepper and place in a zip lock bag with the cut up vegetables. Pour marinade into bag, turn to coat and place in the refrigerator for at least 2 hours. Preheat grill to medium-high heat. Thread steak & vegetables onto skewers (if using wooden, make sure to soak for 30 minutes in water prior to use so they don’t burn). Grill kebabs for 8 or so minutes per side or until steak has reached desired temperature. « Harissa baked egg in an avocado with toast – ready in 20 minutes from start to finish!